The natural gas must be provided at about ambient temperature and be gaseous to use, for example, for driving a CHP. Normally, the liquid gas evaporates and heats unused in an air evaporator absorbing heat from the environment. 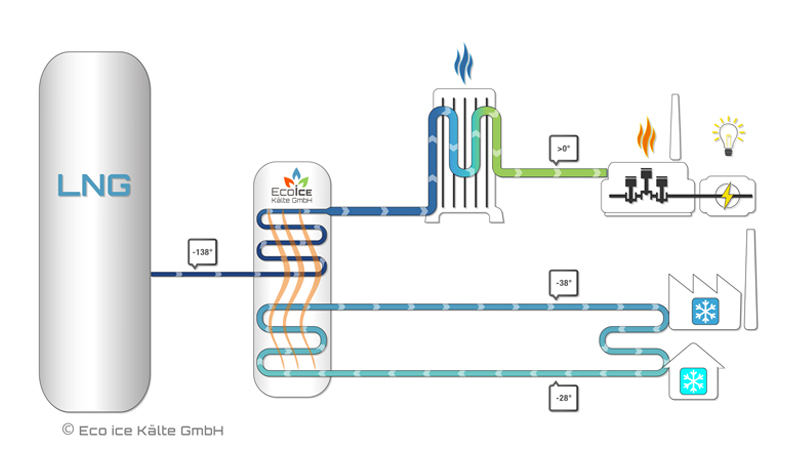 To use the regasification cold, this is transferred without an electric compressor solely by heat transfer from the vaporised gas to a brine circuit. The cold can be supplied to multiple consumers with different effective temperature levels via this brine circuit.